The O'Malleys are off to the beach! But it's a long, hot, boring drive. What can Eric, Bridget, and Nell do to keep busy? 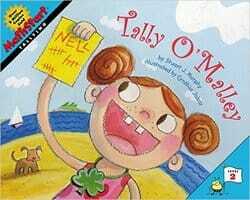 Play tally games, of course - counting up all the gray cars or green T-shirts they see. Whoever has the most marks at the end wins the game. Eric wins the first game. Bridget wins the second. It seems like poor Nell will never win a game! But Nell has the luck of the Irish on her side, and a surprise in store for her big brother and sister.